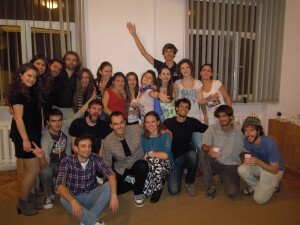 A story of how the sun brought AEGEE-Yerevan and AEGEE-Athina closer thogether and keeps shining on their cooperation. 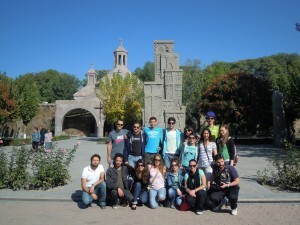 It all started as a joke between Armenak Minasyants from AEGEE-Yerevan and me, Zoi Karapati, more than one year ago. We were in contact with each other for some AEGEE project and I was always finishing my emails with the phrase “Greetings from sunny Athens”. He was always responding “Greetings from sunny Yerevan”. And then a competition started to arise: which is the sunniest? Each one of us claimed that his city is the sunniest and we were “fighting” to defend our opinion in every email! Until one day, just like that, we took the whole matter quite seriously and we decided to cooperate and organise a youth exchange for the members of AEGEE-Athina and AEGEE-Yerevan. We wanted to bring Greeks and Armenians closer and build a stronger relationship because we do have lots in common after all. So, we applied for EU funds (Youth in Action programme) and after a lot of preparation and waiting, the event finally happened in October 2012. 15 Greeks arrived to Yerevan to meet another 15 Armenians and experience a week full of great adventures and unforgettable moments! Our project was dedicated to the promotion of intercultural dialogue and healthy lifestyle. We wanted to encourage mutual understanding and respect of the history and culture of each other and in addition, we wanted to get people understand the great importance of sports and healthy lifestyle so that they become more active and improve their life quality. The day before the official opening of the project some members of AEGEE-Yerevan and also some of the Greek participants who had already arrived to the city, attended the World Cup 2014 Qualifier Game between the Armenian and Italian football teams. This was a unique chance for a first team-building activity and a good motivational start for the sporty week that would follow! During the whole week we had many different workshops, team-building activities, ice-breakers, excursions, flashmobs, street celebrations for Yerevan’s birthday and many other creative activities. Αll days combined both theoretical sessions as well as sport activities, including volleyball, basketball and football. We visited the Cafesjian Modern Art Museum, Sergey Parajanov Museum and also some places in the countryside: Garni, Geghard, Lake Sevan, Dilijan, Khor Virap, Etchmiadzin. Surely there is no AEGEE-event, even within the frames of Youth in Action programme, which does not include a European (or Intercultural in this case) Night. Therefore we all presented our national dances, songs, food and drinks and shared one of the best intercultural experiences. The very last day of the project was also very full and emotional: we visited the Memorial of the Armenian Genocide and also the Genocide Museum. After the official closing and evaluation of the project we had farewell dinner in a traditional Armenian restaurant and then of course partied until late! Without any doubt this programme has been a lifetime experience for all the participants. They learned a lot about a new culture, they broke stereotypes, they discussed common problems, they exhanged ideas, they became even more tolerant and respectful towards different cultures. 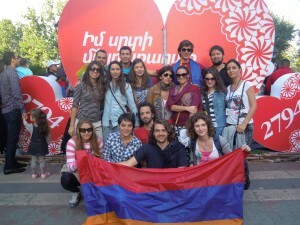 AEGEE-Athina and AEGEE-Yerevan proved to be great partners and are willing to cooperate again in the future. So, was the question answered after all? Who is the sunniest? Well, I can tell you for sure that Yerevan is pretty sunny, in terms of weather and people as well. After all, everybody may be the same or a bit different but in the end, we are all sunny on our own way!